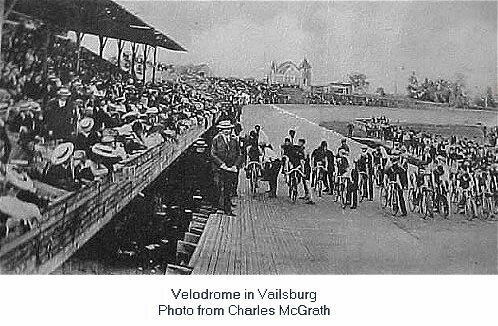 In circa 1900 the Velodrome was located on South Orange Avenue across the street from Vailsburg Park. I believe it was one of the top bicycling tracks in the world. A neighbor of mine on Mead Street by the name of Geiger was a State Trooper. In his youth he competed at the Velodrome and was one of the top racers in the world. That could be an hyperbole but I don't think so. For what ever reason the public lost interest in the sport. See the attached picture of the Velodrome with Electric Park ( amusement park prior to Vailsburg Park ) in the background. Maybe the motorcycle races had an impact on the sport. We also had the Motordrome on South Orange Avenue across from Grove Street. This was used for motorcycle races. Anyway for whatever reason the Velodrome folded. It was replaced by a new sporting arena. The new arena was called the Meadow Brook. It was used for professional boxing. I believe the exterior of the Meadow Brook was square shaped. This interior was the typical arena shape with wooden seats encircling the ring. The outside of the arena was enclosed with a large wooden fence. Local kids would peek through cracks in boards of the fence to watch the fights. On the South Orange Avenue side there was a rectangular shaped building. This was where the admission tickets were sold. From this building they also sold hot dogs, soda and beer. It was like large concession stand in Cooney Island. My father took me there many times to see the fights. It must have left an impression on me because it still is my favorite spectator sport. As a young boy I met Tony Galento (who fought Joe Louis for the Heavy Weight Championship of the World. He was one of the few who knocked Joe to the canvass in his prime) who as a spectator sat near me and my father in the stands.